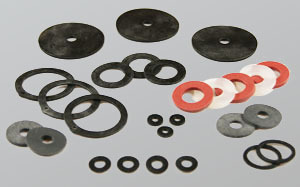 Kingpin manufacture and supply a wide range of nylon washers. These high quality washers can be supplied in any size or shape in order to fit your specific cable gland needs. The genetic makeup of nylon makes it a superb choice for use in washers, as it is incredible durable, making it very resistant to wear and tear. Nylon’s high heat resistance, combined with its durability, make these washers ideal for use in cable glands, which can be subjected to quite a few things within their lifetime. Not that we only supply to the cable gland industry, that is. Kingpin’s range of nylon washers, with their many outstanding attributes, have been put to use in many different industries outside of our specialist area. In the past, we have supplied nylon washers to manufacturers of small electrical goods, and to heavy industry manufacturers alike. They are all big fans of our nylon washers, thanks to Kingpin’s very high standards of quality. This continued demand for our nylon washers hopefully goes some way to showing why Kingpin is a name you can trust. There are as many different shapes and sizes of cable glands as there are applications for them. So we know how important it is to have a washer that is of bespoke size. If the nylon washers are too big or too small to any extent, it can be hazardous to both the quality and the safety of the cable gland set up. So Kingpin have endevoured to acquire the tools and experience necessary to make precision crafted nylon washers. High quality products are what we pride ourselves on, so you can rest assured that the nylon washers you order from us will be perfectly fit for purpose. This is helped by the fact that you will be dealing directly with Kingpin at every stage of the process. Even down to the smallest of details, the product you order will be the exact product you receive. 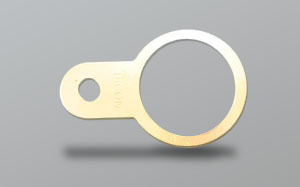 We hold most standard cable gland sizes in-stock, so we can dispatch your order rapidly. If you require a custom size, we have the advanced tooling required to get your order processed as quickly as possible. We offer sizes M1 through M130. The high levels of electricity that can potentially flow through a cable gland can be dangerous if proper precautions aren’t taken. Kingpin’s range of earth tags provides this vital safety step by earthing the glands themselves. Click above to see the full range of sizes and materials available. Cable glands must remain in place is they are to be useful and safe, and locknuts are the component that keeps everything together. Kingpin stock a variety of materials, ready for rapid manufacture. 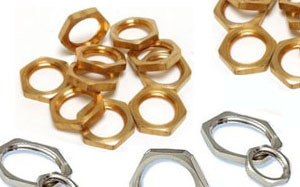 If you were after a different material for your washers, Kingpin are highly likely to have it in stock already. To see the different materials we have for yourself, click above.